The battle between the Ford Motor Company [NYSE:F] Mustang and Chevrolet Camaro for the hearts and minds of American performance enthusiasts is as fierce as it’s ever been in the cars’ 50-plus-year history. With Chevy launching a volley in the form of the redesigned, sixth-generation Camaro in late 2015, it was only a matter of time before Ford responded with a refresh of its sixth-generation Mustang launched a year prior. The 2018 Mustang is everything we expect of a facelift, and then some. Beyond the obvious changes to the fascia, with its lowered nose, resculpted headlights, and its brawny intakes, Ford’s designers touched up bits and pieces across the sculpted body. There’s a slight curve to the taillights, while the new rear bumper and quad exhausts—standard on the V-8-powered Mustang GT—are the highlight at the back of the car. But it’s what’s hiding under that skin that should have the folks at the Renaissance Center and Warren Technical Center nervous. Ford borrowed liberally from the bin marked “GT350” for the updated Mustang, starting with the suspension pieces. Magnetic Ride Control—a fixture on performance-minded Camaros over the past few years—graces Performance Pack-equipped cars, while Ford’s engineers added new shocks, a stiffened rear suspension, and more aggressive sway bars across the range. While some extra torque coming to the Mustang EcoBoost’s inline-4 is exciting—Ford hasn’t released figures—it’s the changes to the Mustang GT that are most exciting. Ford promises more power from the “thoroughly reworked” 5.0-liter V-8, thanks in part to direct injection. More exciting? The engine will rev even higher and partner with a redesigned 6-speed manual transmission equipped with a GT350-derived twin-disc clutch and dual-mass flywheel. Don’t worry two-pedal folks, there’s news for you, too, because along with its old V-6 engine, Ford is also killing the Mustang’s 6-speed automatic. In its place is a new 10-speed automatic. 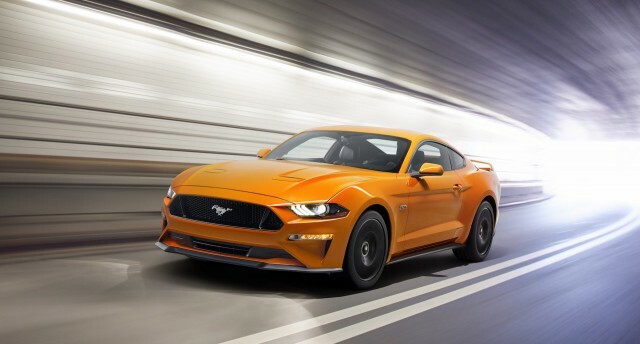 Available on both the Mustang GT and EcoBoost (which retains its 6-speed stick as standard), Ford claims the new 10-speed delivers faster shifts and is more responsive off the line, while also boosting fuel economy for both engines. Typically, we’d leave it at that. But there’s one more big change coming for model year 2018, and it’s in the Mustang’s cabin. You’ll recall last week that Ford showed the first footage of the GT supercar’s new digital gauge clusters—the Mustang will get a similar piece of technology, only better. The new all-digital display spans over a foot and should display its information beautifully. We say “should” because while Ford had an actual 2018 Mustang on display at a backgrounder following last week’s 2017 Detroit auto show, engineers disconnected its electrics. Instead, Ford showed us a looped demonstration of the system as it switched between the car’s various driving modes, with gauges, shift lights, and data appearing and disappearing based on the settings. Like we said, it should look fantastic. But we can’t say that for certain yet. And the same is true of the rest of the car. While your author is a fan (and the only member of the Motor Authority staff to see the 2018 Mustang in person), the reaction from at least one staffer wasn’t nearly so positive. So do us a favor and go settle the tie in the comments by letting us know what you think of Ford’s latest.